Guaranteed Violation Masking or We Pay It! Mask Your Traffic Violation - Guaranteed! You can discreetly take this text course at home, work or in any public place. How do I receive a Completion Receipt? After completing your course the Completion Receipt will be electronically submitted directly to the DMV. You will receive a copy of your Completion Receipt, which can be sent to your insurance company to receive a discount. What are the benefits of DefensiveDriving.com's course? DefensiveDriving.com has been a leader in the driver safety industry and the #1 rated defensive driving course since 2000. Our course is licensed by the state to be used for masking a traffic violation (in accordance with 1808.7 V.C.) and insurance premium discounts. We offer the shortest course and the lowest price allowed by law! DefensiveDriving.com’s mission is to educate and promote safe drivers by informing them of driving trends, dangerous maneuvers and rules of the road. Our defensive driving course is mobile and tablet friendly on most devices. Anywhere you can access the internet via your mobile or tablet device, you can take our course! The flexibility of the course allows you the option to view part of the course from a mobile device, log off and resume the course from an office or home computer where you left off. Is the course 100% over the internet? Yes. You take the entire course on the Internet via your computer, tablet or mobile. Is 24 hour assistance available? Yes. DefensiveDriving.com has licensed instructors and technical support available 24 hours a day, 7 days a week. For assistance, call our toll-free help line at (866) 303-9984. I tried another course before and it put me to sleep. I just went ahead and paid the ticket. This course kept me interested and awake. Thank you for a great way to allow us to take a refresher course on defensive driving that allows us to work at our own pace. This is a great and well thought out course. I am 58 years of age and learned a great deal and have changed some of my driving habits as a result of taking the course. Thanks. This was a very easy, fast course that helped me learn a few things I didn't even know. I was very pleased with the course and would recommend it to anyone. This was the best DD experience I've ever had! Thank you so much. I love you! Our course is California State licensed. While there is no standard cost in California, DefensiveDriving.com offers one of the lowest prices among our competitors. By law, our course length is 340 minutes. Upon course completion, your completion receipt is electronically submitted directly to the DMV. A copy of your Completion Receipt will be available for download, which can be sent to your insurance company to receive a discount. 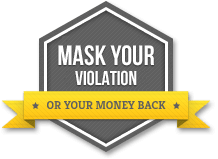 We're so confident that you can mask your traffic violation with our service that we'll give you up to $250 if you don't. We've been doing this a long time (since 2000 to be exact), so we know your traffic violation will be masked. But, in the unlikely event that it isn't, we'd like to contribute some cash toward it, up to a value of $250. Basically, if your traffic violation is $250 or less, we'll give you the full value of your traffic violation, if it's more than that, we'll give you $250. - You do not have court permission to take a defensive driving course to mask a traffic violation. Use of driving course must be within guidelines outlined in 1808.7 V.C. We're so confident that you can mask your traffic violation with our service that we'll pay the traffic violation for you if you don't. As long as you follow the instructions given to you by the court, you'll be able to mask your traffic violation using our service. Payment will be made within 28 days of your successful claim being submitted. You may need to pay the court before you receive payment from us. We will not be held accountable for any costs, fees or charges associated with late payment of your traffic violation.